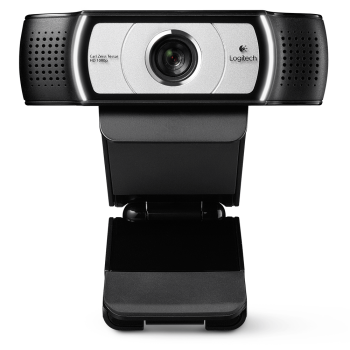 The Logitech Webcam C930e features the widest-ever field-of-view in a business webcam—90-degrees—perfect for face-to-face video collaboration and whiteboard presentations from any office. And it’s the first with HD 1080p H.264/SVC UVC 1.5 encoding, the newest technology that frees up PC bandwidth with on-camera video processing. With pan, tilt and zoom functions and advanced light-correction technology, this webcam delivers the most professional desktop video collaboration experience yet. Make a professional impression in vivid full HD video at up to a smooth 30 frames per second—without taxing your PC processing power. UVC H.264 encoding technology frees up bandwidth by putting video processing within the camera. Now your video meetings can easily include whiteboard presentations or product demos. With an extended 90-degree field of view your clients and colleagues can clearly see you and whatever you’re presenting. And when the webcam is not in use, a convenient privacy screen covers the lens for added privacy and security. Enjoy easy USB connectivity to PCs or Macs and seamless compatibility with your familiar video apps—certified for Microsoft Lync 2013 and Skype, compatible with most UC and web conferencing applications, and supports H.264 1080p for Lync 2013. Smooth autofocus keeps your video image razor sharp, even in close ups. Logitech RightLight 2 technology automatically adjusts for low light or backlit situations so you’re always seen in just the right light. An integrated mounting clip and tripod thread give you the freedom to position the camera wherever it works best—LCD screen, notebook or tabletop.